Experimental Animation: From Analogue to Digital, focuses on both experimental animation’s deep roots in the twentieth century, and its current position in the twenty-first century media landscape. Each chapter incorporates a variety of theoretical lenses, including historical, materialist, phenomenological and scientific perspectives. 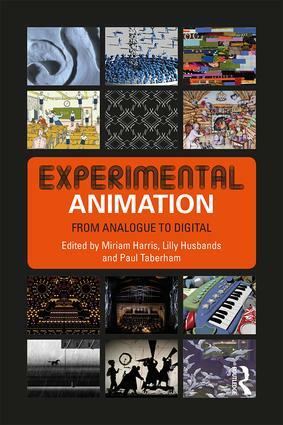 Acknowledging that process is a fundamental operation underlining experimental practice, the book includes not only chapters by international academics, but also interviews with well-known experimental animation practitioners such as William Kentridge, Jodie Mack, Larry Cuba, Martha Colburn and Max Hattler. These interviews document both their creative process and thoughts about experimental animation’s ontology to give readers insight into contemporary practice. Global in its scope, the book features and discusses lesser known practitioners and unique case studies, offering both undergraduate and graduate students a collection of valuable contributions to film and animation studies. Aylish Wood – Where do Shapes Come From? Miriam Harris is an experimental animator, scholar and Senior Lecturer at the Auckland University of Technology, New Zealand. She completed postgraduate study in Digital Animation and Visual Effects at Sheridan College, Toronto, and her experimental animated films have won awards at international film and animation festivals. Her essays have been published in the books Animated Worlds (2007), The Jewish Graphic Novel: Critical Approaches (2008) and 24 Czech and Polish Animators (2011). She is on the editorial board of the animation journal Animation Practice, Process, & Production, edited by Paul Wells. Lilly Husbands is a Lecturer in Animation and Visual Culture at Middlesex University, United Kingdom. Her research is broadly concerned with the legacy and evolution of experimental animation in the context of contemporary multimedia practice. She has published numerous book chapters and articles on experimental animation in journals such as Moving Image Review & Art Journal (MIRAJ), Frames Cinema Journal and Alphaville: Journal of Film and Screen Media. She is an associate editor of Animation: An Interdisciplinary Journal. Paul Taberham is a lecturer and scholar who has published on topics such as film cognition, evolutionary theories of art, avant-garde film and animation, film sound and aesthetics. He is the co-editor of Cognitive Media Theory (2014) and author of Lessons in Perception: The Avant-Garde Filmmaker as Practical Psychologist (2018). In addition, he has spoken internationally at conferences and published articles for several edited collections and journals including Projections: The Journal for Movies and Mind and Animation Journal. He is a fellow of The Society for Cognitive Studies of the Moving Image.